East Meredith, N.Y. – Hanford Mills Museum will offer the first in a series of Free Family Saturdays on May 27. 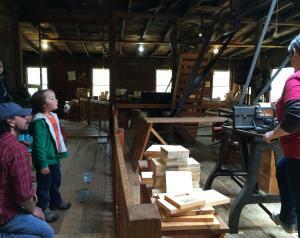 In addition to guided tours of the Museum’s water-powered sawmill, gristmill and woodworking shop, visitors can enjoy special kid-friendly activities as well as music by Catfish Meyer. Meyer will perform acoustic rock and folk music from 11 am to 2 pm. “Free Family Saturdays are an opportunity for kids and their parents or grandparents to explore and learn together. And, with music by Catfish Meyer, it makes for an enjoyable outing,” says Liz Callahan, the Museum’s executive director. She noted that visitors are welcome to bring a picnic lunch. On Free Family Saturdays, up to two adults get in free when accompanied by a child under 18. Children and teens also receive free admission. Additional Free Family Saturday dates are June 17, July 22, August 12 and September 2. Hanford Mills will have educators on hand for Free Family Saturdays who will offer hands-on activities for kids, such as building with gears, experimenting with electric circuits, using enviroscapes to learn about watersheds, and more. Hanford Mills Museum is located at 51 County Hwy. 12, at the intersection of Delaware County Routes 10 and 12, in East Meredith, NY, 10 miles from Oneonta and 15 miles from Delhi. Children 12 and under are admitted free, as are Museum members. The Museum is open Wednesdays through Sundays, 10 am to 5 pm, and also on Memorial Day, Labor Day and Columbus Day. As one of only a handful of operating water-powered mills, Hanford Mills Museum has earned a place on both the National and New York State Registers of Historic Places. The mission of Hanford Mills Museum is to inspire audiences of all ages to explore connections among energy, technology, natural resources and entrepreneurship in rural communities with a focus on sustainable choices.